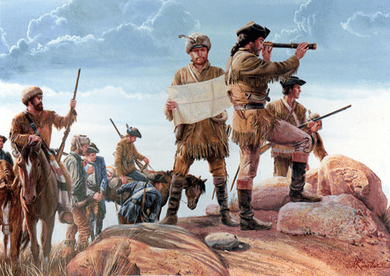 Mort Künstler Hand Signed and Numbered Limited Edition Canvas Giclee:"Lewis and Clark"
Edition Size: Artist Signed and Numbered with COA to 100 total editions. COA included. Image Dimensions: 12" x 17"
About the Art: On May 21, 1804, Captain Meriwether Lewis and Captain William Clark left St. Charles, Missouri on an expedition of the American west. Its purpose was to find "the most direct and practical water communications to the Pacific", to explore the mineral and other resources of the vast territory and report on its flora and fauna; to make precise records of temperature and other such scientific data as would be useful; and to gather material on Indian languages and customs. In November 1805, after an eighteen month journey, Lewis and Clark finally reached the Pacific Ocean.